First time in Berlin, exclusive concert! Limited audience; arrive on time! Pacific 231 is a long run project from Pierre Jolivet originally from Paris, currently based in Dublin. It came into existence in the early 1980s and had belonged to the first wave of industrial / power electronics groups. Early albums were released by Le Syndicat, Cause & Effect, and Bunker Records. Invaluable assistance in due time was given by Psyclones with whom Pierre recorded a couple of albums under the Psy 231 moniker, and released on their label Ladd-Frith. Other notable releases include “Ethnicities” on Rotorelief, “Palestine” in collaboration with Rapoon on Old Europa Cafe and “Cthulhu Revisited” with Vox Populi! on Monochrome Vision. His works now explore the very limit of sound & space. In Berlin Pacific 231 will present his new work “Micromega”, which is his 1st material produced in dolby surround and which will be released on LP with a wafer USB drive (containing two videos set to the music) by Silent Media (USA) in April 2013. Micromega is an electric guitar experiment in processing, cut-up, and real time de-instrumentation. Rutger Zuydervelt was born on 28 July 1978 in Apeldoorn (The Netherlands), but now resides in Rotterdam. He started working as Machinefabriek in 2004. Except for a few piano and guitar lessons when he was young, Rutger didn’t study music. Instead, he graduated as a graphic designer. The sleeves of his releases are practically always designed by Rutger himself, being a crucial part of the music. 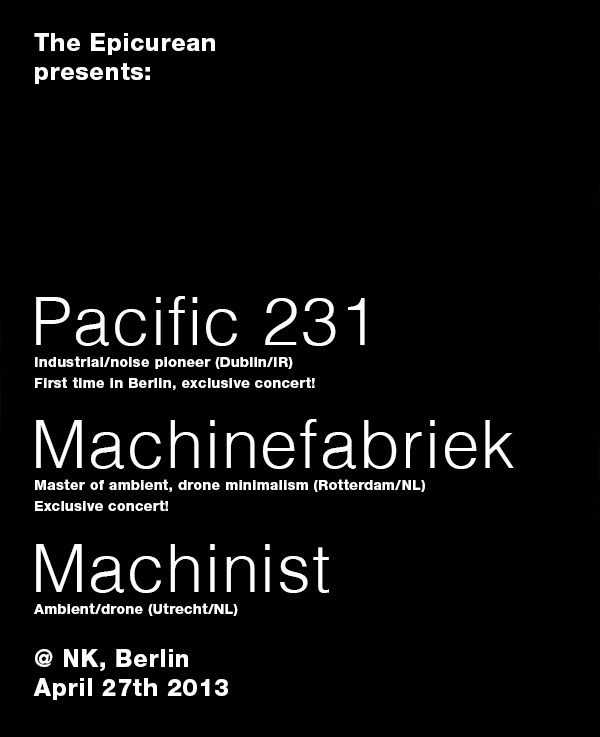 Machinefabriek’s music combines elements of ambient, modern classical, minimalism, drone and field recordings. His pieces unfold as ‘films without image’, with a sharp ear for detail. After releasing a series of self released CD-Rs, the official debut, ‘Marijn’, was issued by Lampse in 2006. Since then a solid stream of singles and albums was released on labels like Type, Important, Home Normal, 12K, Dekorder, Digitalis, Experimedia and Staalplaat. Performing live has been an important expression for Machinefabriek. He took his gear all over the globe, from Canada to Israel and from Russia to Japan. Rutger collaborated (on record and/or live) with numerous artists, such as Steinbrüchel, Jaap Blonk, Aaron Martin, Peter Broderick, Frans de Waard, Simon Nabatov, Simon Scott, Steve Roden, Gareth Davis, Stephen Vitiello, Michel Banabila and Tim Caitlin amongst others. Rutger also works with various film makers, like Chris Teerink, for whom he composed a soundtrack for his documentary about Sol LeWitt. Then there's Stone, a film feauturing Edward Norton and Robert DeNiro, which has Machinefabriek music in the final scene. Rutger also scored music for dance pieces, video installations and sculptures. He made installations for Stedelijk Museum Amsterdam, NAi (Dutch Architecture Institute) and the new Armando Museum (MOA). These cross-disciplinary projects are something Machinefabriek will focuss on more and more. “My work focuses on the synergy between the sonic, the visual and the spatial. To me, music and sound don't just move along a chronological axis, as in the procession of resonant waves with respect to linear time. Music and sound also extend into depths or heights and yet other dimensions or perspectives, also into tactile and mental spaces. The focus of my work is the immersive quality of spatiality in sound and vision.